Santiago de Cuba, a UNESCO world heritage site is Cuba's 2nd largest and most exotic city. It's enigmatic appeal is wholly unique on the island. It's architecture carries a unique imprint and the people have evolved their own regional expressions of music and dance. Many different ethnic groups have settled here and the culture of the city is an eclectic mix that creates a unique Caribbean culture with African, Chinese, Indigenous, French Haitian, and Spanish influences. The mixture of these cultures is shown in the richness of the music and dance, many forms of which originated in Santiago de Cuba, such as the Conga, Rumba, and Son (which later developed into what people call salsa today). Santiago de Cuba is also where Castro launched his revolution in July 1953 with an ill-fated assault on the Moncada barracks. One can still go there today and see the bullet holes, from Castro's invasion, in the barrack walls. This city of broad boulevards and intimate plazas has its old town laid out in a grid tilting down to the harbor. History echoes down the narrow streets graced by timeworn buildings painted in sun-bleached pastels. Every July, the famous Cuba Carnival is held in Santiago. This event is a massive party, which lasts several days and includes a number of cultural events, music, food, and various parties throughout the city. Comparas - competitive musical groups - parade through the streets in musical melees full of fun and sensual content. Revelers dress as orishas (gods) and clowns with huge papier-mache heads; others adopt period colonial costume or strip down to sequined, befeathered bikinis. The blare of Chinese cornets and the pounding of bata drums echoes through the streets as conga lines and parade floats march down Avenida Jesus Menendez and the entire city indulges in a no-holds-barred celebration. The carnival of Santiago de Cuba is the largest, most famous, and most traditional carnival in all of Cuba and is an explosion of color, contagious drum rhythms dance and endless, spectacular photographic opportunities. July 20: Miami, Florida. Allowing for people to arrive during the day, we will have our first group meeting and trip briefing at dinner. July 21: We will meet in morning after breakfast, for our flight to Cuba. We will arrive in Santiago de Cuba tonight and will be staying at the centrally located Casa Grande Hotel. A perfect location to explore the city and experience the Carnival, which peaks on July 26. July 22-27: Santiago De Cuba. July 27: Flight to Havana. July 27-August 1: Our hotel in Havana is the four-star Hotel Telegrafo, ideally located across the street from Parque Central, bordering Old Havana and Central Havana and a 10-minute walk down the Prado to the Malecón. 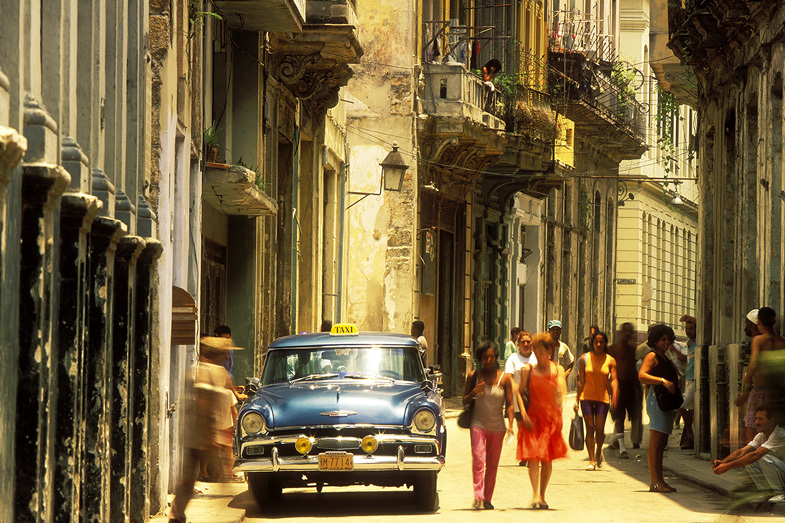 The perfect location for exploring Havana's endless photographic opportunities. August 1: Our final day in Cuba begins with another sunrise shoot, followed by more image reviews and/or more photography in and around Havana. After breakfast we will transfer to the airport for our scheduled 3pm departure back to Miami. Havana and Santiago de Cuba, the two cities in which we will be spending most of our time, were made for walking. From the old American cars, to the faded buildings, to the fishermen standing on the The Malecón with the hot tropical sun setting behind them, there is a never-ending visual feast to choose from. The photographic possibilities are truly astounding - a photographer's dream location. It's not figuring out what to take photos of, but rather trying not to be overwhelmed by the staggering amount of choices. Much of the shooting will be during our walks in Havana and Santiago. Please see Highlights section below for a (very) small selection of possible locations we will visit in Havana.